Born in Boston, Massachusetts, but raised in Denver and Sacramento, Eve Marie Torres is a dancer, model, wrestler and actress. She is probably best known for being a WWE Divas Champion. She describes herself on Twitter as 3X WWE Divas Champion, instructor for the Gracie Women Empowered Self-defense program, winner of NBCs Stars Earn Stripes and hard-working woman! Eve is also trained in Brazilian Jiu-Jitsu and holds a blue belt from the Gracie Jiu-Jitsu Academy in Torrance, California. Eve Torres is of Nicaraguan descent. I believe my mixed cultural background has helped mebeing raised with the influences of two different cultures, I feel, created diversity in my interests, human relationships, and opened my eyes to the worlds possibilities (hispanicbusiness.com). She added, Its a great feeling to know that, through my hard work, I am adding to a long list of accomplishment for Latinas in the United States. Eve Torres attended the University of Southern California on a full tuition scholarship. While there, she appeared in commercials and music videos and was also the co-captain of the USC Fly Girls dance squad. Eve danced for the Southern California Summer Pro League. After graduation, she danced and modeled full time, becoming a member of the Los Angeles Clippers Spirit Dance Team. But it was the WWE that garnered her the most attention. In 2007, she entered the WWE Diva Search and was crowed the winner. Subsequently, she trained for her wrestling debut in Florida Championship Wrestling and the rest is history. Eve said, I have been in a mans world as long as I can remember. I was an engineering major in college, I am a sports entertainer in the WWE, and I teach self-defense. I cant you the number of times I have been underestimated, objectified or deprived of fair credit for my accomplishments based on my gender or ethnicity. We can either be discouraged by these societal limitations, or we can overcome them and strengthen our will to succeed. 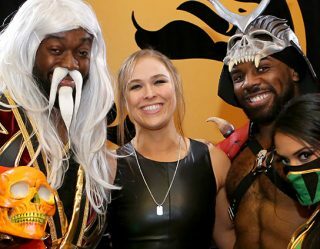 Aside from wrestling, she appeared on an episode of Deal or No Deal, Stars Earn Stripes and Extreme Makeover: Weight Loss Edition. She also appeared in video games and on magazines. She said of Star Earn Stripes: Im a strong supporter of the military, and Ive been overseas to support them and entertain the troops. So the fact that I could raise money for military charities was an awesome opportunity (ign.com). Eve Torres is engaged to Rener Gracie. They live in Redondo Beach, California.